On March 14, 2018, Lowe's announced the end of their 17-year sponsorship of Hendrick Motorsports' No. 48 team driven by Jimmie Johnson after the 2018 season. On October 28, 2018, Hendrick Motorsports announced that Ally Financial signed a two-year deal to sponsor the No. 48 team starting in 2019. Ally had previously been with the Hendrick team when they were still known as GMAC. On August 5, 2018, Leavine Family Racing announced that their technical alliance with Richard Childress Racing would end after the 2018 season. On October 9, 2018, LFR announced they would enter a technical alliance with Joe Gibbs Racing in 2019. On August 23, 2018, Front Row Motorsports purchased majority of the assets of the bankrupt BK Racing for US$2.08 million. With this purchase, FRM would field a third team in the 2019 season. The third team was formally announced on November 27, 2018 as the No. 36 Ford driven by Matt Tifft. On September 3, 2018, Obaika Racing announced that they would run a few races in the Cup series in 2018, before moving to full-time in 2019. On February 8, 2019, Obaika Racing withdrew from the 2019 Daytona 500 qualifying due to various circumstances. On September 4, 2018, Furniture Row Racing announced that they would close their doors following the 2018 season. On November 16, 2018, Timmy Hill announced that MBM Motorsports would attempt to enter two teams at the 2019 Daytona 500, with Hill driving the No. 66 Toyota. On November 26, 2018, Tommy Baldwin Racing announced their rebirth, and that they would run the Daytona 500 and select other races. On November 27, 2018, Rick Ware Racing hinted they would field a second team in 2019. The existing No. 51 team is using a charter leased from Richard Petty Motorsports and is officially registered as "Petty Ware Racing". On December 21, 2018, the team confirmed that they purchased a charter from Front Row Motorsports for their No. 52 team. In addition, the team purchased a fleet of Ford stock cars from FRM and Chevrolet stock cars from Leavine Family Racing, which switched to Toyota. On December 4, 2018, it was announced that sponsorship agency Spire Sports + Entertainment purchased the charter previously owned by Furniture Row Racing. The new team would field the No. 77 Chevrolet in the 2019 season. A driver, crew chief, technical alliance, or sponsor were not announced at that time. NY Racing Team announced on December 11, 2018 that they would be returning for the 2019 season with Ford as its manufacturer. During Richard Childress Racing's 50th anniversary press conference on December 14, 2018, it was announced that the No. 31 would change to the No. 8 for 2019, the same car Daniel Hemric made his first two Cup starts in during the 2018 season. In addition, RCR announced that the charter they were leasing to StarCom Racing has been sold to the team. With StarCom Racing buying the 36th and final charter from Richard Childress Racing, TriStar Motorsports is left without a full-time charter for 2019. On December 17, 2018, StarCom Racing announced that they have moved to a new facility based in Salisbury, North Carolina, and upgraded their engine deal with ECR Engines. On February 5, 2019, Germain Racing announced that they would field a second team at the 2019 Daytona 500. The No. 27 Chevrolet was built and staffed in collaboration with Premium Motorsports owner Jay Robinson. On February 14, 2019, Xtreme Concepts Inc. announced that it has formed XCI Racing and would field the No. 81 Toyota at Texas and Talladega. The team has a technical alliance with Joe Gibbs Racing. On August 16, 2018, it was announced that Kasey Kahne would be retiring from full-time racing following the 2018 season. On September 4, 2018, it was announced that the No. 78 Furniture Row Racing team would fold, leaving Martin Truex Jr. a free agent for 2019. On November 7, 2018, it was announced that Truex would join Joe Gibbs Racing in 2019 to replace Daniel Suárez in the No. 19 team. On September 7, 2018, it was announced that Matt DiBenedetto would not return to Go Fas Racing in 2019. On September 10, 2018, it was announced that Jamie McMurray would not return to Chip Ganassi Racing in 2019. CGR had offered McMurray a contract to drive at the 2019 Daytona 500 before moving to a leadership position with the team. On December 12, 2018, Fox Sports announced that McMurray has joined its Fox NASCAR broadcast team as an analyst for NASCAR RaceDay and NASCAR Race Hub starting in 2019. On September 12, 2018, it was announced that Trevor Bayne would not return to Roush Fenway Racing in 2019. On October 7, 2018, Matt Kenseth, who shared the No. 6 Ford with Bayne, announced he has no plans to race after the 2018 season. On September 15, 2018, it was announced that Ryan Newman would not return to Richard Childress Racing in 2019. Later on September 21, 2018, it was confirmed that Newman would move to Roush Fenway Racing in the No. 6 full-time, replacing Bayne and Kenseth. On September 25, 2018, it was announced that A. J. Allmendinger will not return to JTG Daugherty Racing in 2019. Three days later, it was announced that Ryan Preece will take over the No. 47 car and compete for 2019 Rookie of the Year honors. Meanwhile, Allmendinger would join the NBC Sports booth as an analyst for IMSA events and would also contribute to NASCAR America. On September 28, 2018, it was announced that Daniel Hemric would replace Ryan Newman in the No. 31 (now the No. 8) for Richard Childress Racing and compete for 2019 Rookie of the Year honors. On October 6, 2018, it was announced that Ross Chastain would be returning to the No. 15 Premium Motorsports Chevrolet on a 'handshake deal'. Team owner Jay Robinson states he would not hold back Chastain if a better opportunity presents itself. On October 10, 2018, Leavine Family Racing announced that Matt DiBenedetto has signed a two-year contract to drive the No. 95 Toyota. On November 12, 2018, Cole Whitt announced his retirement from competing in NASCAR following the 2018 season with TriStar Motorsports. On November 27, 2018, Front Row Motorsports announced that Matt Tifft will drive the No. 36 Ford and compete for 2019 Rookie of the Year honors. On December 2, 2018, Kurt Busch announced that he will not return to Stewart-Haas Racing in 2019. On December 4, 2018, it was announced that Busch and sponsor Monster Energy signed a one-year deal with Chip Ganassi Racing to drive the No. 1 Chevrolet. It is also believed that 2019 will be Busch's final year of full-time NASCAR competition, unless his season works out particularly well and he and Chip Ganassi would revisit an option for 2020. On December 3, 2018, Obaika Racing announced that Tanner Berryhill will run full-time in the No. 97 Toyota and compete for Rookie of the Year honors. On December 11, 2018, it was announced that J. J. Yeley would drive NY Racing Team's No. 7 Ford Mustang in 2019. On December 17, 2018, StarCom Racing announced Landon Cassill as their full-time driver for the 2019 season. On December 17, 2018, it was announced that Corey LaJoie would be driving for Go Fas Racing full-time for the 2019 season. On January 7, 2019, it was announced that Daniel Suárez will drive the Stewart-Haas Racing No. 41 Ford in 2019. On January 16, 2019, it was announced that Ryan Truex would return to the MENCS to drive the Tommy Baldwin Racing No. 71 for the Daytona 500. On January 16, 2019, MBM Motorsports announced that Joey Gase would attempt to run 90 percent of the full 2019 race schedule in the No. 66 car. On January 16, 2019, Rick Ware Racing announced plans to have Mike Wallace drive the No. 52 car at Atlanta, Auto Club and Las Vegas with the possibility of additional races. However, it seemed that the deal fell apart as Cody Ware, B. J. McLeod, Bayley Currey, Gray Gaulding, and Jeb Burton have shared the No. 51 and No. 52 cars. On January 18, 2019, Spire Motorsports announced that Jamie McMurray would pilot their No. 40 Chevrolet at the 2019 Advance Auto Parts Clash and the Daytona 500 with backing from Cessna, Bass Pro Shops, and McDonald's for the team's first NASCAR start and McMurray's final race. The car will be renumbered as the No. 77 after the Daytona 500. On January 22, 2019, it was announced that Quin Houff will drive the Spire Motorsports No. 77 Chevrolet part-time in 2019, starting with the TicketGuardian 500 at ISM Raceway on March 10. On February 18, 2019, it was announced that Garrett Smithley will drive the No. 77 at the 2019 Folds of Honor QuikTrip 500 at Atlanta Motor Speedway. On January 25, 2019, it was announced that Cody Ware would drive the Rick Ware Racing No. 51 Chevrolet at the Daytona 500. On February 1, 2019, Richard Childress Racing announced that Tyler Reddick would attempt to run the Daytona 500 in the No. 31 Chevrolet. On February 5, 2019, Germain Racing announced they would field a second entry for Casey Mears in the No. 27 Chevrolet for the Daytona 500. On February 14, 2019, XCI Racing announced that Jeffrey Earnhardt would drive the No. 81 Toyota for two races in 2019. On September 4, 2018, it was announced that the No. 78 Furniture Row Racing team will fold, leaving Cole Pearn a free agent for 2019. On November 7, 2018, it was announced that Pearn would join Martin Truex Jr. in the Joe Gibbs Racing No. 19 team in 2019. On October 10, 2018, Hendrick Motorsports announced that starting in 2019, Chad Knaus will move to the No. 24 team to become William Byron's crew chief while Kevin Meendering from JR Motorsports will become Jimmie Johnson's crew chief. Darian Grubb, who served as Byron's crew chief in 2018, will remain at Hendrick Motorsports but as a technical director for the organization. On October 23, 2018, Roush Fenway Racing announced that former Joe Gibbs Racing crew chief Scott Graves will replace Matt Puccia as the crew chief of the No. 6 team driven by Ryan Newman. RFR is working on a future role for Puccia. On November 16, 2018, Denny Hamlin tweeted that he will be parting ways with crew chief Mike Wheeler at the end of the 2018 season. On December 6, 2018, Joe Gibbs Racing announced that Chris Gabehart from the Xfinity Series has been appointed as the new crew chief of the No. 11 team. On November 26, 2018, it was announced that Danny Stockman would replace Justin Alexander as Austin Dillon's crew chief in the 2019 season. Stockman previously served as the crew chief in Dillon's Camping World Truck Series and Nationwide Series seasons. On November 27, 2018, Leavine Family Racing announced that Mike Wheeler will be the No. 95 team's crew chief in 2019. On January 14, 2019, it was announced that former Richard Petty Motorsports crew chief Drew Blickensderfer will move to Front Row Motorsports as the crew chief of the No. 34 Ford driven by Michael McDowell. On January 15, 2019, StarCom Racing announced that Wayne Carroll will serve as crew chief of the No. 00 team. Tony Furr, who served as crew chief of the No. 00 team last season, will move to Mullins Racing in the ARCA Racing Series. On January 31, 2019, Richard Petty Motorsports announced that lead engineer Derek Stamets has been promoted to the crew chief of the No. 43 Chevrolet driven by Darrell Wallace Jr.
On February 5, 2019, Germain Racing announced that Pat Tryson will be the crew chief of the No. 27 Chevrolet driven by Casey Mears at the 2019 Daytona 500. With the discontinuation of the Fusion after the 2018 model year, Ford unveiled a new body style based on the Mustang GT. On October 10, 2018, Leavine Family Racing announced their switch from Chevrolet to Toyota in the 2019 season. For the 2019 season, Rick Ware Racing will use Ford and Chevrolet cars, dropping Toyota from their lineup. RWR had used all three manufacturers in the 2018 season. On October 2, 2018, NASCAR announced the new rules package for the 2019 season. The new package will have a smaller tapered spacer which will reduce the engine's horsepower from 750 bhp (560 kW) to 550 bhp (410 kW) for tracks that are larger than one mile to foster tighter racing. This will also include a taller spoiler at 8 in (203.2 mm) by 61 in (1,549.4 mm), a wider radiator pan with 37 in (939.8 mm) at the front and 31 in (787.4 mm) at the rear, and a larger splitter with an overhang of 2 in (50.8 mm). Along with the aerodynamic changes, all current restrictor plate races except for the 2019 Daytona 500 will no longer be using the traditional restrictor plate rules and instead will be using the new 2019 package with the effect of the aerodynamic changes and engine restrictions, which makes it the first time a race at Daytona or Talladega to race without the traditional restrictor plates since 1987. At the same time, NASCAR will be reducing the number of organizational tests for the year from four to three, and Goodyear tests will also be reduced from four teams to three. On October 8, 2018, NASCAR announced that the driver-adjustable trackbar will not be allowed in the 2019 season. On February 4, 2019, NASCAR announced a change in the qualifying schedule procedures for majority of its tracks. For short tracks and intermediate speedways, the first round will be shortened from 15 minutes to 10 minutes, while the second and third rounds will remain at 10 and five minutes, respectively. The down time intervals at all tracks will be reduced from seven minutes to five minutes. Superspeedway qualifications will retain their untimed two-round intervals of single-lap qualifying while road courses will continue to use two qualifying rounds: 25 minutes for the first round and 10 minutes for the final round. The 2019 schedule was released on April 3, 2018. There are no calendar changes in the schedule from the 2018 season; however, Sonoma Raceway will return to the original 2.52 mile course configuration for the first time since 1997. The race times were announced on December 11, 2018. The only change was the Las Vegas playoff race being moved to prime time that day compared to last year. In Daytona 500 qualifying, William Byron won the pole while Alex Bowman qualified second. This was the fifth consecutive Daytona 500 pole won by Hendrick Motorsports and the first with all four cars in the top 4. Daytona Speedweeks started with the Advance Auto Parts Clash, with Paul Menard drawing the pole and leading the most laps. The race went under a red flag after the first few laps due to rain. 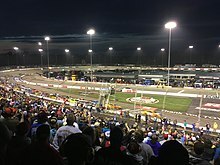 The race returned to green and then the field pitted for the competition caution followed by another red flag for rain. After the restart, Jimmie Johnson spun Menard, resulting in "The Big One" that claimed most of the field including Kyle Busch, Brad Keselowski, Kevin Harvick, and Clint Bowyer. The race went red again due to rain during the caution and it was called, giving the win to Johnson. In the Duels on Thursday, Byron led the first Duel. Kyle Busch spun after making contact with Johnson. Harvick took the lead after pit stops and held off Ricky Stenhouse Jr. for the win. In the second duel, Bowman started in the lead. Joey Logano made a last lap pass on Bowyer to win. William Byron started on pole. Kyle Busch won the first stage while Kurt Busch spun. Ryan Blaney won the second stage. Cody Ware spun when coming to pit road and collected Tyler Reddick and Jimmie Johnson. Kyle Larson and Brad Keselowski both spun after tire issues. Matt DiBenedetto led the most laps, but was involved in a accident with Blaney, Paul Menard, Chase Elliott, Martin Truex Jr., and others. On the restart, Clint Bowyer got turned and collected Byron, Austin Dillon, Ryan Newman, and others. In overtime, Denny Hamlin was able to hold off teammate Kyle Busch for his second Daytona 500 win in four years. Aric Almirola started on pole. Kyle Larson won the first stage while Kevin Harvick won the second stage. Some top runners including Almirola, Larson, and Ricky Stenhouse Jr. had speeding penalties. Kyle Busch got into the wall and had a tire go down. During the final round of green flag pit stops, Ryan Preece ran into the back of B.J. McLeod. Brad Keselowski, battling the flu, took the lead from teammate Joey Logano and held off Martin Truex Jr. for his second Atlanta win and his 60th win overall at Team Penske across Cup and Xfinity. Kevin Harvick started on pole. Kyle Larson and Austin Dillon suffered pit road penalties in the first stage during green flag stops. Harvick won the first stage of the race. In the second stage, Kyle Busch had a speeding penalty while making a pit stop under green flag. Joey Logano won the second stage of the race. In the final stage, Logano held off teammate Brad Keselowski to win the race. Ryan Blaney started the race from pole position. In the first stage, Erik Jones spun from a flat tire and Brad Keselowski hit the wall after an issue in the right front of the car caused a tire to go down. Blaney won the first stage of the race and Kyle Busch won the second stage of the race. In the final stage, Michael McDowell and Ryan Preece were involved in wrecks while Matt DiBenedetto had a mechanical issue. Blaney was leading late in the race until Kyle Busch passed him with 17 laps to go. Kyle Busch went on to win the race, his first win of the season, and completed a weekend sweep, having won the Xfinity Series race the day before. Austin Dillon started the race on pole. Toward the end of the first stage, Austin Dillon had a tire go down. Kyle Busch went on to win the first stage and the second stage of the race. Kyle Busch had a pit road speeding penalty at the end of the second stage, giving the lead to Brad Keselowski. In the final stage of the race, Darrell Wallace Jr. brought out a caution during a round of green flag pit stops, putting Kyle Busch back toward the front. Kyle Busch took the lead and would go on to win his second straight race and 200th race across all three national series, tying the record set by Richard Petty. Joey Logano started on pole. Michael McDowell got into the wall and Ty Dillon and William Byron got together. Kyle Larson got into McDowell, ending the day for McDowell. Brad Keselowski won both stages and dominated, leading 446 laps and holding off Chase Elliott for his second win of the season and second at Martinsville. Jimmie Johnson started on pole. Erik Jones spun early as Brad Keselowski had to go to the garage for several laps due to rear-end issues. Johnson led most of the stage. Joey Logano was able to get the lead off pit road and win the first stage. Daniel Hemric had a tire go down and spun and Kyle Larson slammed the wall and caught on fire. Denny Hamlin was able to get the lead off pit road and won the second stage. Ryan Blaney had led until he his engine expired. Kyle Busch led the most laps, but got loose and got into the wall and had to go to pit road. Hamlin, who suffered back-to-back pit road penalties, was able to get back in the lead after the final round of green-flag pit stops and held off Clint Bowyer for his second win of the season. Chase Elliott started the race on pole while Kevin Harvick had to start from the rear and serve a pass-through penalty for failing pre-race inspection. At the beginning of the race, Ricky Stenhouse Jr. got into Kyle Busch and sent him spinning, with Aric Almirola also involved in the wreck. Ty Dillon won the first stage while Joey Logano won the second stage. Ryan Blaney led the most laps in the race. Elliott was spun from contact from behind toward the end of the second stage and lost power steering. In the final stage, Kyle Larson made contact with another car and got in a wreck with William Byron, Denny Hamlin got a pit road speeding penalty while leading, and Clint Bowyer cut a tire and got into the wall. During a late caution, most of the leaders came to pit road while a few cars stayed out, giving the lead to Kyle Busch. Kyle Busch held off his older brother Kurt Busch to win the race, his third win of the season and eighth at Bristol. Kevin Harvick started on pole. Harvick led early, but Kyle Busch took the lead and won the first stage. Kyle Larson spun and slammed the wall. Joey Logano would take the lead and win the second stage. Michael McDowell had a tire go down and slammed the wall. Martin Truex Jr. took the lead and led the most laps. Clint Bowyer was able to catch Truex and take the lead, but Truex regained the lead after the final round of green-flag pit stops. Bowyer got to Truex's bumper and tried to take the lead, but was unable to and lost second to Logano. Truex continue to lead with Logano on his bumper and Truex was able to hold on for his first career short-track win in his first of the season. ^ a b "Ford unveils 2019 Mustang for NASCAR Cup Series". NASCAR.com. NASCAR Digital Media, LLC. August 9, 2018. Retrieved September 12, 2018. ^ "No. 48 team to have new primary sponsor in 2019". Hendrick Motorsports. March 14, 2018. Retrieved September 25, 2018. ^ Utter, Jim (October 29, 2018). "Jimmie Johnson finds new sponsor in Ally Financial for 2019 season". Motorsport.com. ^ a b c "Leavine Family Racing adds DiBenedetto, moves to Toyota for 2019 season NASCAR.com". NASCAR.com. NASCAR Digital Media, LLC. October 10, 2018. Retrieved October 11, 2018. ^ Pockrass, Bob (August 23, 2018). "Front Row Motorsports wins bid for most of BK Racing's assets". ESPN. Retrieved September 12, 2018. ^ a b "Front Row Motorsports adds third team, signs Matt Tifft to drive No. 36". NASCAR.com. NASCAR Digital Media LLC. November 27, 2018. Retrieved November 28, 2018. ^ "Obaika Racing Planning Return To NASCAR". Speed Sport. September 3, 2018. Retrieved September 14, 2018. ^ Obaika Racing (February 8, 2019). "Statement from Obaika Racing". Motor Racing Network. Retrieved February 9, 2019. ^ a b c Pockrass, Bob (September 6, 2018). "Furniture Row Racing fails to land sponsor for '19, to shut down". ESPN. Retrieved September 12, 2018. ^ Catanzareti, Zach (November 16, 2018). "Timmy Hill to Attempt 2019 Daytona 500 with MBM". Kickin' the Tires. Retrieved December 9, 2018. ^ "Tommy Baldwin Racing returning to Monster Energy Series in 2019". NASCAR.com. NASCAR Digital Media, LLC. Retrieved November 26, 2018. ^ Page, Scott (November 27, 2018). "Two full-time teams for Rick Ware Racing in 2019?". Jayski's Silly Season Site. ESPN. Retrieved November 28, 2018. ^ "Rick Ware Racing Expands for 2019". MRN.com. Motor Racing Network. December 21, 2018. Retrieved February 27, 2019. ^ "Rick Ware Racing expands with second Cup car, Xfinity entry". Rick Ware Racing. January 6, 2019. Retrieved February 20, 2019. ^ Pockrass, Bob (December 4, 2018). "Spire Sports + Entertainment forms new team". ESPN. Retrieved December 5, 2018. ^ Seelman, Jacob (December 4, 2018). "Spire Purchases Charter From Furniture Row Racing". Speed Sport. Retrieved December 5, 2018. ^ a b "New meets old: Daniel Hemric to pilot No. 8 Chevrolet for RCR". NASCAR.com. NASCAR Digital Media, LLC. December 14, 2018. Retrieved December 15, 2018. ^ Crandall, Kelly (December 14, 2018). "Some nuggets from Richard Childress ... organization is selling its third charter to the 00 team; newcomer Tyler Reddick will be the only NXS eligible driver with Randell Burnett as his crew chief #NASCAR". Twitter. Retrieved December 14, 2018. ^ a b c d "StarCom Racing purchases charter and locks up Cassill for 2019". Jayski's Silly Season Site. ESPN. December 17, 2018. Retrieved December 17, 2018. ^ a b c "Casey Mears to run second Germain Racing entry for Daytona 500". NASCAR.com. NASCAR Digital Media, LLC. February 5, 2019. Retrieved February 5, 2019. ^ "Kasey Kahne reveals 2018 will be last full-time season". NASCAR.com. NASCAR Digital Media, LLC. August 16, 2018. Retrieved August 16, 2018. ^ a b "Martin Truex Jr., Cole Pearn to join Joe Gibbs Racing in 2019". NASCAR.com. NASCAR Digital Media LLC. November 7, 2018. Retrieved November 8, 2018. ^ a b c d e f g h i j k l m n o Kraft, RJ (December 3, 2018). "On the Move: 2019 changes". NASCAR.com. NASCAR Digital Media, LLC. Retrieved December 4, 2018. ^ Utter, Jim (September 7, 2018). "Matt DiBenedetto to leave GoFas Racing after the 2018 season". Motorsport.com. Retrieved September 12, 2018. ^ "Report: Jamie McMurray out of No. 1 next year". NASCAR.com. NASCAR Digital Media, LLC. September 10, 2018. Retrieved September 12, 2018. ^ Long, Dustin (September 10, 2018). "Report: Chip Ganassi Racing's No. 1 Cup car open for next year". NBC Sports. Retrieved September 25, 2018. ^ "Jamie McMurray joins FOX Sports broadcast team as an analyst". NASCAR.com. NASCAR Digital Media, LLC. December 12, 2018. Retrieved December 13, 2018. ^ "Report: Jack Roush: Trevor Bayne will not return to No. 6 in 2019". NASCAR.com. NASCAR Digital Media, LLC. September 12, 2018. Retrieved September 12, 2018. ^ Pockrass, Bob (October 7, 2018). "Matt Kenseth has no plans to race after NASCAR Cup Season". ESPN. Retrieved October 16, 2018. ^ "Ryan Newman announces he won't return to Richard Childress Racing". NASCAR.com. NASCAR Digital Media, LLC. September 15, 2018. Retrieved September 15, 2018. ^ "Report: Ryan Newman to Join Roush Fenway Racing in 2019". NASCAR.com. NASCAR Digital Media, LLC. September 21, 2018. Retrieved September 22, 2018. ^ "AJ Allmendinger will not return to JTG Daugherty in 2019". NASCAR.com. NASCAR Digital Media, LLC. September 25, 2018. Retrieved September 25, 2018. ^ "Ryan Preece earns full-time Monster Energy Series ride with JTG Daugherty Racing". NASCAR.com. NASCAR Digital Media, LLC. September 28, 2018. Retrieved September 28, 2018. ^ "A.J. Allmendinger's versatile racing career leads him to perfect role as NBC motorsports analyst". AwfulAnnouncing.com. Retrieved December 19, 2018. ^ NBC Sports (December 19, 2018). "Allmendinger joins NBC Sports Group as motorsports analyst". NASCAR.com. NASCAR Digital Media, LLC. Retrieved December 23, 2018. ^ "Childress promotes Daniel Hemric to Monster Energy Series, No. 31 ride". NASCAR.com. NASCAR Digital Media, LLC. September 28, 2018. Retrieved September 28, 2018. ^ "Ross Chastain to return to the No. 15 on a handshake deal". Jayski's Silly Season Site. ESPN. October 6, 2018. Retrieved October 8, 2018. ^ "TriStar Motorsports announces Cole Whitt retires from racing". NASCAR.com. NASCAR Digital Media LLC. November 12, 2018. Retrieved November 12, 2018. ^ Cain, Holly (December 4, 2018). "Kurt Busch to drive No. 1 for Chip Ganassi Racing in 2019". NASCAR.com. NASCAR Digital Media, LLC. Retrieved December 5, 2018. ^ "Kurt Busch and sponsor move to Chip Ganassi Racing for 2019". The Washington Post. December 4, 2018. Retrieved December 5, 2018. ^ Page, Scott (December 3, 2018). "Obaika Racing to run full Cup schedule with Tanner Berryhill". ESPN. Retrieved December 4, 2018. ^ "Landon Cassill to return to StarCom Racing in 2019". NASCAR.com. NASCAR Digital Media, LLC. December 17, 2018. Retrieved December 18, 2018. ^ Albert, Zack (December 20, 2018). "Go Fas Racing taps Corey LaJoie for No. 32 Ford in 2019". NASCAR.com. NASCAR Digital Media, LLC. Retrieved December 23, 2018. ^ "Ryan Truex to attempt Daytona 500 start with Tommy Baldwin Racing". NASCAR.com. NASCAR Digital Media, LLC. January 16, 2019. Retrieved January 16, 2019. ^ Bonkowski, Jerry (January 16, 2019). "Mike Wallace ready to make another run at NASCAR Cup racing". Yahoo Sports. Retrieved January 17, 2019. ^ "Spire Motorsports partners with CGR to field Daytona 500 car for Jamie McMurray". NASCAR.com. NASCAR Digital Media, LLC. January 18, 2019. Retrieved January 19, 2019. ^ "Quin Houff Joins Spire For Select Cup Races". Speed Sport. Turn 3 Media, LLC. January 22, 2019. Retrieved January 23, 2019. ^ McFadin, Daniel (February 18, 2019). "Garrett Smithley in Spire Motorsports car at Atlanta as entry lists revealed". NBC Sports. Retrieved February 19, 2019. ^ Page, Scott (January 25, 2019). "RFID Solutions to serve as associate sponsor of Cody Ware for 2019 season". Jayski's Silly Season Site. ESPN. Retrieved January 26, 2019. ^ "Tyler Reddick To Enter Daytona 500 For RCR". Speed Sport. February 1, 2019. Retrieved February 1, 2019. ^ Rutherford, Kevin (February 1, 2019). "Tyler Reddick to Enter Daytona 500 with RCR". Frontstretch. Retrieved February 2, 2019. ^ Long, Dustin (October 23, 2018). "Scott Graves to be Ryan Newman's crew chief at Roush Fenway Racing". Yahoo! News. Retrieved October 23, 2018. ^ "Hamlin tweet: Been 'a great ride' with crew chief Mike Wheeler". NASCAR.com. NASCAR Digital Media, LLC. November 16, 2018. Retrieved November 17, 2018. ^ Utter, Jim (December 6, 2018). "JGR names new crew chief and car chief for Denny Hamlin". Motorsport Network. Retrieved December 7, 2018. ^ Pockrass, Bob (November 26, 2018). "Danny Stockman to be Austin Dillon's crew chief in the 2019 season". ESPN. ^ "Leavine Family Racing announces Mike Wheeler as No. 95 crew chief". NASCAR.com. NASCAR Digital Media, LLC. November 27, 2018. Retrieved November 28, 2018. ^ "Michael McDowell: New Crew Chief". Rotowire. January 14, 2019. Retrieved January 16, 2019. ^ Bonkowski, Jerry (January 15, 2019). "Wayne Carroll to serve as Landon Cassill's crew chief, Tony Furr moves to ARCA team". NBC Sports. Retrieved January 16, 2019. ^ "RPM taps Derek Stamets as crew chief for No. 43 Chevy in 2019". NASCAR.com. NASCAR Digital Media, LLC. January 31, 2019. Retrieved February 1, 2019. ^ a b "NASCAR announces 2019 baseline rules packages". NASCAR.com. NASCAR Digital Media, LLC. October 2, 2018. Retrieved October 2, 2018. ^ "Monster Energy Series to forgo restrictor plates at Daytona, 'Dega". NASCAR.com. NASCAR Digital Media, LLC. October 2, 2018. Retrieved October 2, 2018. ^ "Driver-adjustable trackbar no longer in play for 2019". NASCAR.com. NASCAR Digital Media, LLC. October 8, 2018. Retrieved October 8, 2018. ^ Albert, Zack (February 4, 2019). "Quaifying tweaks among several competition updates". NASCAR.com. NASCAR Digital Media, LLC. Retrieved February 5, 2019. ^ "NASCAR releases 2019 Cup schedule". Jayski's Silly Season Site. ESPN. April 3, 2018. Retrieved August 12, 2018. 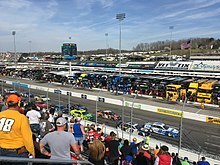 ^ "Start times for 2019 Monster Energy Series schedule revealed". NASCAR.com. NASCAR Digital Media LLC. December 10, 2018. Retrieved December 11, 2018. ^ "Gander RV to Sponsor May 5 Monster Energy NASCAR Cup Series Race at Dover International Speedway". Dover International Speedway. NASCAR Digital Media, LLC. April 4, 2019. Retrieved April 5, 2019. ^ Pistone, Pete (February 10, 2019). "Byron Wins Daytona 500 Pole". MRN.com. Motor Racing Network. Retrieved February 10, 2019. ^ Pistone, Pete (February 10, 2019). "Johnson Captures Clash Win". MRN.com. Motor Racing Network. Retrieved February 10, 2019. ^ Pistone, Pete (February 14, 2019). "Harvick, Logano Duel Winners". MRN.com. Motor Racing Network. Retrieved February 14, 2019. ^ Pistone, Pete (February 17, 2019). "Hamlin Wins Second Daytona 500". MRN.com. Motor Racing Network. Retrieved February 17, 2019. ^ Pistone, Pete (February 24, 2019). "Keselowski Wins at Atlanta". MRN.com. Motor Racing Network. Retrieved February 24, 2019. ^ Pistone, Pete (March 3, 2019). "Vegas Jackpot for Logano". MRN.com. Motor Racing Network. Retrieved March 3, 2019. ^ Pistone, Pete (March 10, 2019). "Kyle Busch Sweeps ISM Raceway". MRN.com. Motor Racing Network. Retrieved March 10, 2019. ^ Pistone, Pete (March 17, 2019). "Milestone Win for Kyle Busch". MRN.com. Motor Racing Network. Retrieved March 17, 2019. ^ Pistone, Pete (March 24, 2019). "Keselowski Dominates Martinsville". MRN.com. Motor Racing Network. Retrieved March 24, 2019. ^ Pistone, Pete (March 31, 2019). "Hamlin Takes Texas Win". MRN.com. Motor Racing Network. Retrieved March 31, 2019. ^ Pistone, Pete (April 7, 2019). "Eight is Great for Busch at Bristol". MRN.com. Motor Racing Network. Retrieved April 7, 2019. ^ Pistone, Pete (April 13, 2019). "Truex Jr. Conquers Richmond". MRN.com. Motor Racing Network. Retrieved April 13, 2019. This page was last edited on 18 April 2019, at 22:07 (UTC).